Shooting a 12 Gauge shotgun can be exhausting work. The large loads typically include a high volume of powder, which produces quite a bit of recoil. Furthermore, most manual action shotguns come equipped with little to no recoil dampening technology. 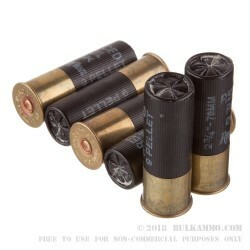 It'd be impossible to add a muzzle break and be friendly to shotshells. So what do you do if you want to fire your bukshot without a sore shoulder the next day? You use low recoil shells! 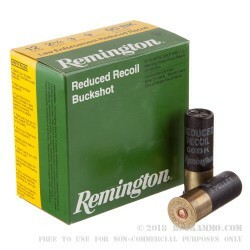 These Remington LE 00 buckshot reduced recoil shells will let you fire your shotgun without having to ice your shoulder the next day. 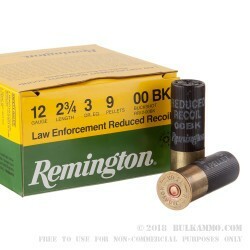 Remington's 12 Gauge Law Enforcement Reduced Recoil shot shells fire a 9 pellet 00 Buck load out of a 2 3/4'' shell, producing 3 drams equivalent of energy. The shells come packaged in cardboard boxes of 20 each.